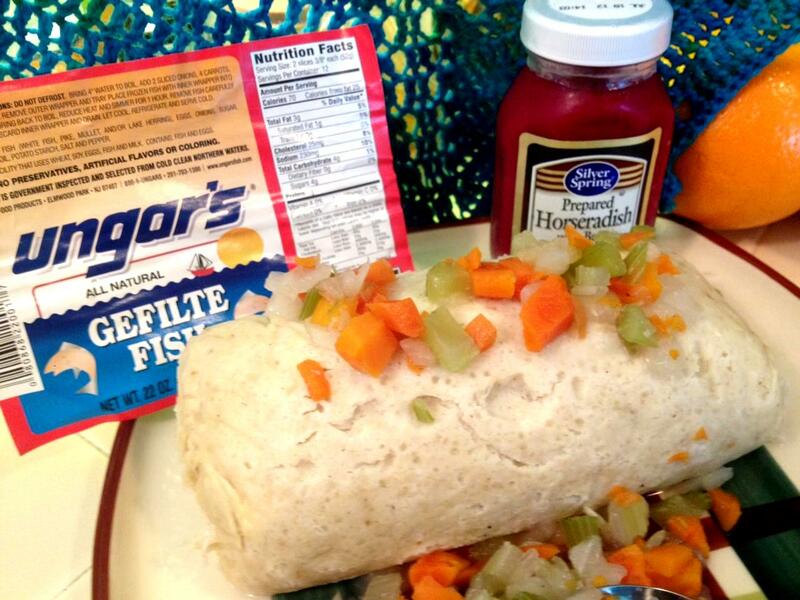 Well, it’s official– gefilte fish is going mainstream. A few weeks ago I heard about a new modern-day pushcart in Manhattan called Gefilteria. They call themselves the “Purveyor of Boutique Gefilte,” and they serve up “artisanal” gefilte fish selections that are made from sustainable fish sources. Gefilte is also featured at Kutsher’s Tribeca, a “modern American Jewish bistro” giving Ashkenazi fare a thoroughly modern treatment. A Manhattan extension of the famous Kutsher’s in the Catskills, the Tribeca bistro serves their gefilte fish with micro-greens and parsley vinaigrette. I haven’t had a chance to try either place yet, but next time I’m in New York you can bet I’ll be doing some taste testing. In my experience, I’ve found that gefilte is one of those dishes you either love or hate– there doesn’t seem to be much middle ground. I fall on the side of loving it, but only when it’s really well made. My husband’s mom created a delicious (if time consuming) gefilte fish recipe that is out of this world. A reflection of her husband’s Ashkenazi background and her own Sephardic ancestry, her gefilte is gently seasoned and stuffed into a fillet of fish. I’ve hesitated to blog about it, because I’m just not sure how many people like gefilte. I don’t really like overly sweet gefilte fish, and I’m not a big fan of the stuff in the jars. But a good homemade gefilte is something truly delicious– light, clean, fresh, with just a hint of sweetness. That’s the kind of gefilte I go for. I’m curious to hear your feedback. 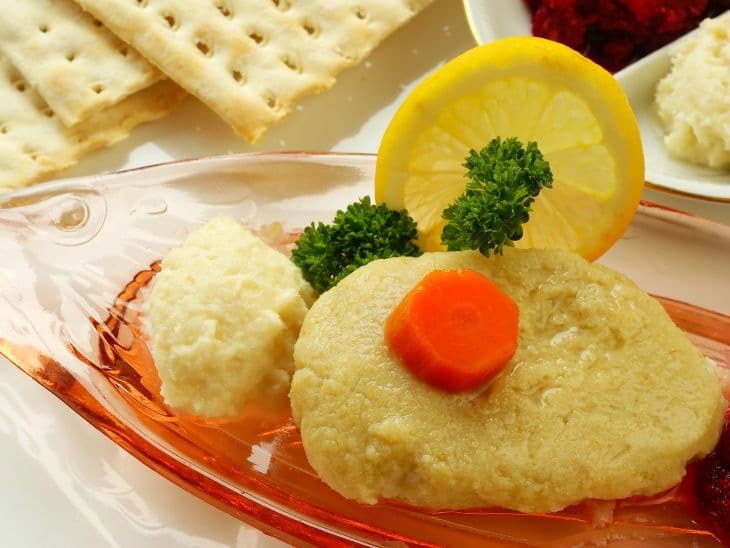 Are you a fan of gefilte fish? Is it something you only eat on holidays, or do you enjoy it year-round? Does the site of gefilte make you run in the other direction? 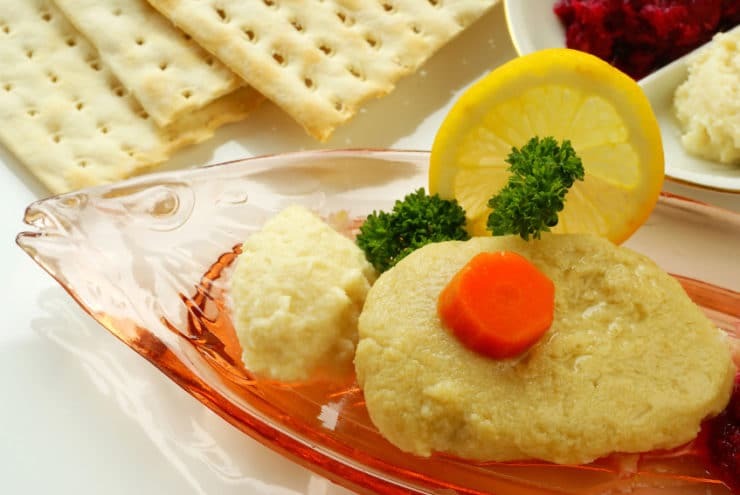 What do you think of this “artisanal gefilte fish” trend– is there something to be said for updating a centuries-old food concept? Comment below and let me know what you think! Tory, I’d like your Mother-in-laws recipe for Gefilte Fish, mine seems todisintegrate in the Broth, how do you prevent that from happening? Hi Helen! This is something I need to put some time into, I’ve never put it into proper measurements before. I will keep it in mind for a future post! You have been my go to Shiksa for a very long time for Jewish recipes. I think you should go for it in exploring gefilte. I used to be very close to you in Los Angeles but moved to Florida 8 years ago. I am the goy in the kitchen in our house, and my wife would live on take out if I didn’t cook. I met a close friend and worked with him in a small deli here in Sarasota for a time. He taught me to make gefilte fish and because what comes in a jar is horrible, I many times thought to can it for close friends during the holidays. Since fish is prevalent here, getting fish heads for stock is a piece of cake. If you are interested in any recipes should you wish to dig deeper let me know. I would love to see what you got. I make your hummus all the time. My friend with the Israeli heritage is a great Jewish caterer here, which gives me access to great stuff. I live in Sarasota and would love to find good Gefilte Fish. Which deli did you work in that made it? Or any place you can recommend. I would be happy with frozen loaves also, like Ungar’s, etc. Some Publix carry Meal Mart which is nowhere as good as Ungar’s. I would be grateful for any suggestions. Thank you. Gefilte fish comes in many varieties, based on the country you are from. The polish version is pretty sweet, and I don’t like it. My mother in law (from Ukraine) made the best one in the world. It was so light and fluffy you were floating in the sky while eating it, and not sweat, but more savory. Unfortunately she is quite old, and is not doing it anymore. Of course, you can’t get the recipe, because it is always, a pinch of that and a little of this, so nothing you can replicate. If anyone has a good recipe, I would love to get it. I love Gefilte! But not the canned stuff. I haven’t attempted it yet but I will one of these days. i wonder if you get the a and b frozen gefilte fish roll in israel thats what i use here and it is also there my friends tell me. My husband and I love gefilte fish, but we really only eat it on Pesach and Rosh HaShanah. I don’t know how to make it, so we only have gefilte on special occasions when we travel to Bnei Brak (we live in Israel) to buy it. Worth every penny too! I would love to know your recipe for gefilte fish! I’ve been waiting for the perfect recipe to come along to try to make it at home. I love gefilte fish and we eat it Rosh Hashanah, Pesach and a couple of times a year. My family love my fish. I use all pickerel fillets and it is scrumtious. Gefilte fish from the jar in the liquid broth. (Not the sweet kind.) At Fresh & Easy Markets, they have it without MSG and sugar. We cook some carrots and onion with the broth from the jar, then let the gefilte simmer there too. After that you can eat it warm from the pot or refridgerate for later. Serve with some of the soft carrots on a lettuce leaf. You nailed it Tori. When I’ve eaten it prepared homemade, mostly by Orthodox women with lots of time and passion for this kind of cookery, I find it delicious, but I can’t abide the store-bought stuff in jars. And I’d generally prefer to skip the gefilte fish for something fresher and more savory- as an Italian Sephardi, the texture and the sweet taste of gefilte fish just skeeze me out. I’m thinking of making an Italian version like the Venetian and Tuscan Jews do- something with tuna fish and savory herbs and olive oil. My Mom is 87 and she continues to make gefilte fish for Passover for our family of 43. Each of my five sisters has watched, helped and recorded her making it. She adds less than a tablespoon of matzah meal to the fish, eggs and onions and cooks the balls over the fish bones. All my brothers in law and my dad get together and make fresh horseradish to go with it. Just the root and vinegar and lots of grinding. And the stronger the better. They make a fun day of it. Homemade gefilte fish and homemade horseradish. That’s Passover to me! I make gifilte fish every week by taking a frozen loaf removing the paper and baking it in the oven at 375 till it gets brown and a bit crusty on the outside. I have had many sefardic and gifilte fish fobic guests eat it and they love it. Ahhh, gefilte fish. My mom made hers from scratch even into her mid 80s. And yes, the question Elle raised….”will it gel?” was always the big question. As my mom got older, the 60s, I would travel to my folks’ home and spend the day there helping her as she insisted that all be chopped by hand, no food processor, grater or anything else. Then the fish became difficult to find locally as just about nobody besides my mom was making it so she and I would drive an hour and a half from home to a kosher market that would order it for her, then we’d drive back and the chopping and all would begin. She also insisted on whitefish, pike and carp, that she called buffel carp. After the fish was cooking in the pot I would go outside and grate the horseradish which she also insisted be done that way, not bought in any jar. It was a special treat, my mom’s gefilte fish, and she would tell the family gathered around her table at Passover or Rosh Hashonah what I would call her “fish story’ about that year’s adventure in procuring the fish. The whole thing is a wonderful memory and nobody else’s tastes as good as my mom’s….so I just don’t eat it anymore. Ahh, yes, the hand grated horseradish. 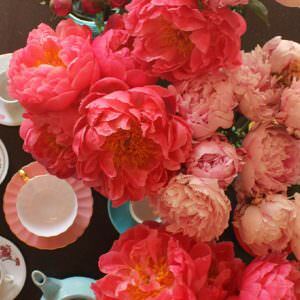 It’s so delicious, but the scent is so strong I can barely handle the grating process– I have super sensitive eyes, and it brings me to tears! I love gefilte fish in all versions, but especially the frozen kind. Growing up my mom would make it from scratch for holidays and I always found it too watery, so she gave up putting in all the hard work and would buy the frozen and cook it how we like it, a bit sweet, with lots of sliced onions and carrots on the side, horseradish too. Tori, I too married a Sephardi who won’t go anywhere near gefilte fish, let alone look at it, for whom I have coined the term “gefilte-phobia” 🙂 I made it one time since we’ve been married and wait for the opportunity to have it when we’re invited out or go to my parents (who live pretty far away). I’ve made Jane Brody’s GF loaf for 20 years. This year I pulled a new recipe off the web that added minced celery to the loaf. I love my own GF loaf, but I hate the stuff in the jar. I won’t eat it if it is served on a buffet and it is polite to avoid it. I’ve used John Dory, Whitefish, Tilapia and a few other fishes. Everyone – even children – loves the Jane Brody recipe. It is a tad sweet, but not overkill. 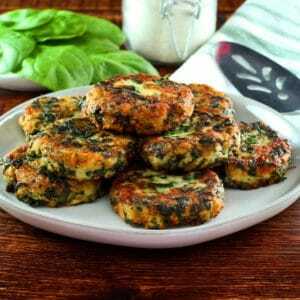 It is an easy dish to make if you own a food processor. I’ve made up to four loaves at a time for large seders. It is my favorite potluck seder item to bring. Everyone is impressed and it really isn’t that much work with the aid of a Cuisinart. I also love gefilte fish and always have, year-round, ever since I was little. My favorite jarred GF I discovered some years ago was Manischewitz Premium Gold (or whatever they called it! ), but I never see that any more. Many brands of GF have MSG in them, so I avoid them. The Ungar’s one, mentioned above, is also quite good and almost seems like home-made (except not so stinky)! 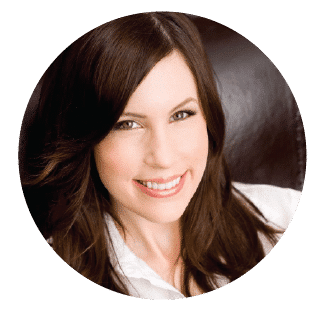 Hi Tori – I love it! My cousin Geri makes it for our Passover every year. It’s my favorite breakfast the next morning, with fresh made horseradish, matzohs, and black coffee. My mom’s gefilte fish was great…she no longer makes it. I remember going to a cousin of her’s that made FALTCHE GEFILTE FISH (false/imitation) from chicken breast when she couldn’t get the traditional carp, white fish, and pike. We love it so much that I’m reduced to cooking the jarred once. I put the gel into a pot with sliced carrots and onions sugar & pepper, cook for approx. 1 hr. add the fish and simmer for approx. 1 hr. We eat it with strong horseradish salad with beets. On Passover I grade my own horseradish and add it to the jarred. But OH! do I long for the HOME MADE stuff. I love gefilte fish and eat it probably 4 times a year. I have no real preference to jar or can and I usually buy whatever is on sale. However, I MUST have horseradish on it! My Mom used to take the canned fish, heat it in the oven and put carrot on top of it. Delicious. I have never tried “real” gefilte, just my grandma’s “fake” version that was made with chicken (and I had never trusted the stuff in the jars). She had a yiddish name for it but I can’t remember it! I don’t like the look or smell of jarred gefilte fish. And the rare times throughout my life that I’ve had the courage to taste it, I was less than impressed. I just can’t get past the gelatiness goo. And to be fair, I’ve never had homemade gefilte fish. I LOVE gefilte fish, as do my kids (even the picky one). While I will happily eat jarred (I second the Rokeach Vienna, because my grandmother bought it and so it tastes like I am used to), I prefer the frozen loaf that you cook in broth with vegetables. My aunt Rachel made the best homemade gefilte fish in the galaxy. I’ve never tasted anything like it and unfortunately don’t have the recipe. I would love to read your mother-in-law’s. It sounds intriguing. Like Jews of the past, I have incorporated “native” fish into my recipe and make the best gefilte fish ever. I use salmon, steelhead trout, grouper and halibut and people who hate gefilte fish love mine. If it wasn’t so much trouble to make, I would keep it around. If you can offer a recipe that would change my mind about gefilte fish, you’ve earned my forever respect and admiration (whichk, actually, you already have). Your mother-in-law’s recipe sounds interesting. Just went into reading glasses, would be nice if I’d use them. Sorry for the typo! My mother was a Holocaust survivor, and she made gefilte fish every Passover (and only at Passover). It seemed to take days, but maybe that was just the house smelling like fish for days. Anyway, it was the most glorious thing. Light but deeply flavored. Getting the gel to “gel” was always a big deal. Would it? Wouldn’t it? There is nothing that comes close to the combination of texture and flavor that she achieved in that gefilte fish. I love Gefilte fish. I agree with you that people either love it or hate it. I gave not made my own from scratch. Would love to see your mother n’ laws recipe for Gefilte fish. I usually have the Manashevitz in the jar. I have made a “mock” Gelfilte fish using chicken or those who don’t like fish. I used ground chicken, egg, matzo meal, onions, kosher salt & pepper.